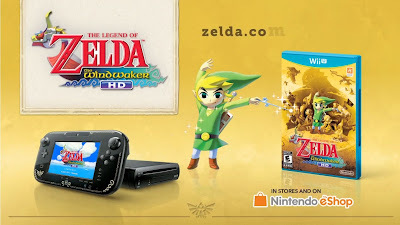 A través de un comunicado de prensa, por fin se ha hecho oficial la fecha de lanzamiento del esperadisimo remake HD de una de las entradas mas queridas de The Legend of Zelda, hablamos de The Wind Waker, el cual llegara acompañado también de un bundle con consola Deluxe y un control decorado con temas alusivos al juego. La fecha elegida por Nintendo es el 4 Octubre de 2013, así que alisten sus billeteras y prepárense para desembarcar en una nueva aventura. To celebrate the launch of The Legend of Zelda: The Wind Waker HD for Wii U on Oct. 4, Nintendo is adding some extra magic to the Seattle stop of The Legend of Zelda: Symphony of the Goddesses concert tour. The currently touring concert that features music from The Legend of Zelda series performed by a full orchestra will be performing in Seattle at Benaroya Hall on Sept. 12. The Seattle performance will not only feature the legendary musical arrangements fans all over the country have fallen in love with, but it will also include kiosks with game-play demos of The Legend of Zelda: The Wind Waker HD for Wii U and The Legend of Zelda: A Link Between Worlds for Nintendo 3DS, unique photo opportunities and fan art that will be displayed during the performance. A contest to determine the fan art that will be displayed during the show is currently running on the Nintendo Facebook page. Fans can submit images and videos inspired by The Legend of Zelda: The Wind Waker HD. The top 50 submissions will appear in a video that will run before the performance, while the top five winners will also have their work on display in the lobby of Benaroya Hall. The event address is Benaroya Hall,200 University St. Seattle, WA 98101.